The Waterberg bushveld region is magnificent; that is the long and the short of it. It is said that the Waterberg was given this name by Voortrekker settlers, who recognised that water was plentiful and pure in this territory. Now that this incredible wilderness area of Limpopo Province in South Africa forms part of the Waterberg Biosphere Reserve, and is a World Heritage Site since UNESCO declared it so in 2001, the Waterberg is well and truly on the map. However, and most fortunately, the Waterberg and Welgevonden are protected and not overexploited by profiteers, big businesses, and swarms of tourists. Because of its status, this is unlikely to change, thankfully. As it is, so many species of indigenous game are under threat right across Africa and also in this country, because of man’s destructive behaviour – poaching, indiscriminate hunting, claiming ever more wilderness territory and animal habitat for agriculture and human settlement, which creates pollution and indicates a lack of care for the natural environment. Not so in the wonderful Waterberg, home of the 35 000 hectare Welgevonden Game Reserve and our luxury five-star game lodge, Fifty Seven Waterberg, so named because the lodge is located on Portion 57 of Welgevonden. Both Welgevonden Game Reserve and Fifty Seven Waterberg are privately owned and managed, and do not admit the public at large, as do the National Parks in South Africa. The freely roaming game animals in our part of the Waterberg have never been hunted by man. Consequently, in the normal course of our bi-daily game viewing, our guides and rangers are able to give our guests an up close and personal experience of finding and observing wild animals that behave normally and are not overly skittish, fleeing instantly at the sight, sound, or smell of human presence. 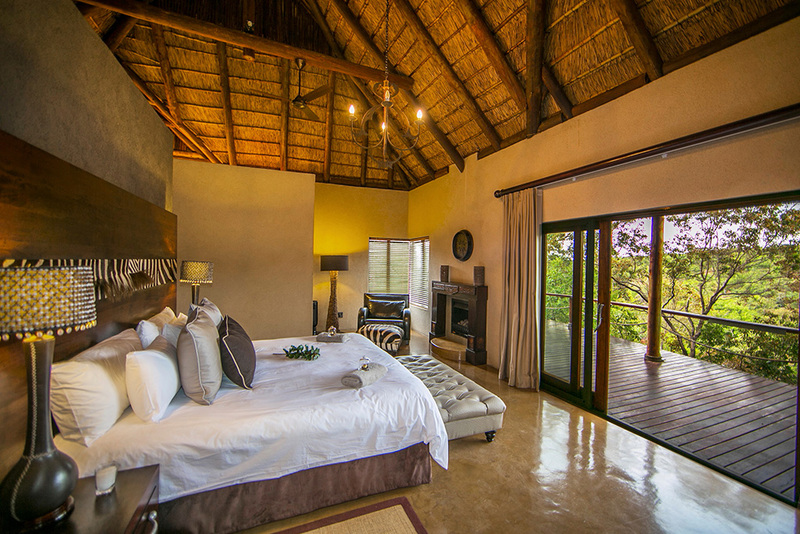 Only guests who have accommodation bookings at our game lodge are permitted to enter the reserve, and then only a total of 10 adults at any given time. Fifty Seven Waterberg’s guests are accommodated in elegant, understated five-star luxury in five super spacious, thatched chalets, none being smaller than 80 square metres. Throughout the guests’ suites and the main lodge buildings, the emphasis is always on guests’ comfort, convenience, luxuries, and impeccable personal service of five-star standards (or better, where possible). In turn, it is also a luxury of a different kind to be in the midst of our mixture of wonderful, unsullied Waterberg mountainous bushveld plateaux, gorges and rolling hills, verdant vegetation fed by mountain streams, and all the creatures, great and small, that occur here naturally. Our game lodge’s luxury amenities, cuisine, and service are not unexpected, because we are a five-star luxury establishment and winner of multiple awards of excellence in the travel, tourism, and hospitality industries, also as voted by guests. Notwithstanding these welcome accolades, our visitors are nevertheless delighted to experience such excellence and luxury in the heart of such an untamed, natural paradise, where signs of human activity are few and far from one another – the very real reason for the intimate atmosphere and discreet privacy that our guests value, welcome, and enjoy. We would welcome the opportunity to meet, greet, treat, and spoil you with our typical lovely, private luxury at Fifty Seven Waterberg’s exclusive game lodge.